2-In-1 Sublimation Ink Mug Press. Small Latte 12oz mug wrap. This is our higher end model commercial duty mug press. It is stronger, heavier, better electronic, better heat mat than our low end model. Dual display digital gauge: Timer and temperature. Auto temperature stabilization Adjustable temperature setting. Auto timer/alarm countdown: Adjustable timer setting. High Quality Mug Wrap: It can fit 11 oz. High Quality Latte Wrap: It can fit 12 oz latte tapered mugs. All mugs are not exactly straight walled. It has a 1 to 3 degrees tapper (so they can be pull out from the mold). This mug clamping feature has a floating bar. It will automatically distribute the pressure evenly across the face of the mug. What is sublimation paper: It is a paper that does not absorb ink. The sublimation ink printed on the paper will vaporized away from paper when heated. What is sublimation ink: It is an inkjet ink that you put into Epson printer cartridges. This ink will vaporized when heated. What is sublimation mug: It is a white coffee mug that has a coating on it. The coating will "catch" or absorb the ink vaporized from the paper. (Sorry we do not carry mugs at this time). How to print your digital photo onto mug. Print it out on sublimation paper with sublimation ink in your printer. Cut the paper image to about 3" x 8" size. Wrap the image facing in the sublimation coated mug. Place the mug in the mug press cup holder. Set temperature to 200 C.
Set the desired time varies from 45 sec. Longer time leads to darker impression. Take the mug out when timer buzz. Your customized mug is done! Some Info: Check out website such as Zazzle. They are a very successful business. Your advantage is showing your art work in front of your customers. This machine is nice addition to your printing business. About Us: Our operation is extremely streamlined. (Very minimal overhead, no receptionist, no bells and whistles) We get our equipments factory direct with our own onsite QC inspectors so we can bring you quality machines at the lowest possible prices. Please read all terms before purchasing, by purchasing this product you agree to all terms. An operating instruction/tips and tracking info will be emailed. Feel free to visit our store. It usually takes 21 days to get to your place. Please leave us you contact telephone number. On the return, we will. 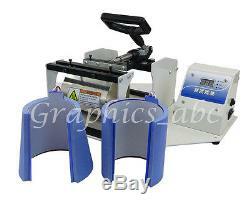 Heat press must be in its original package box and not in damaged condition. Item must be in the same condition as when item was sent. We stock most of the parts. However, we do guarantee the mug press will not DOA. Mug heat mat under proper use can last thru 1000's of mugs. If need extra heat mat, we do carry them for your convenience. The item "2 In 1 Mug Heat Press Sublimation Transfer Coffee Mug Latte Cup" is in sale since Thursday, January 08, 2015. This item is in the category "Business & Industrial\Printing & Graphic Arts\Screen & Specialty Printing\Heat Transfer\Presses". The seller is "graphics_abc" and is located in Alhambra, California. This item can be shipped to United States, Canada.